Home > coupon > Qoo10: Super Sale with Up to $120 Cart Coupons Up for Grabs! 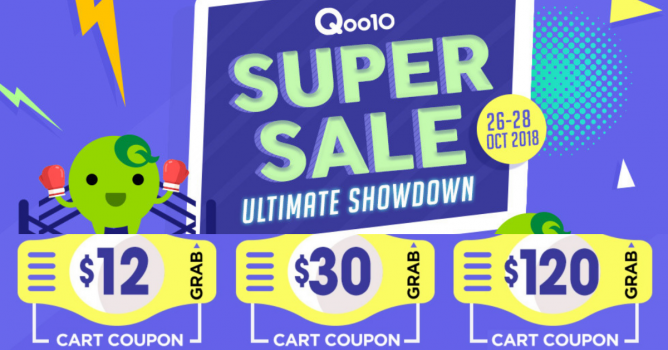 26 - 28 Oct 2018 Qoo10: Super Sale with Up to $120 Cart Coupons Up for Grabs! The Qoo10 Super Sale is back this weekend, from 26 – 28 October 2018, and they’re bringing the month’s best products back into the spotlight! Plus grab up to $120 coupons to save on your purchases! If you missed out on the 10/10 deals earlier this month, keep an eye out for big discounts this Friday to Sunday. Don’t say we never say – it may be your last chance to snag these items at such good prices. Previous: Metro: Open to ALL – Get 20% OFF Storewide & Online Including Cosmetics & Fragrances!